Calling All Beauty Pros – Wanna Be On TV? Hola team – I’ve just been notified of a brilliant beauty opportunity by TwoFour, an award winning television production company based in London. 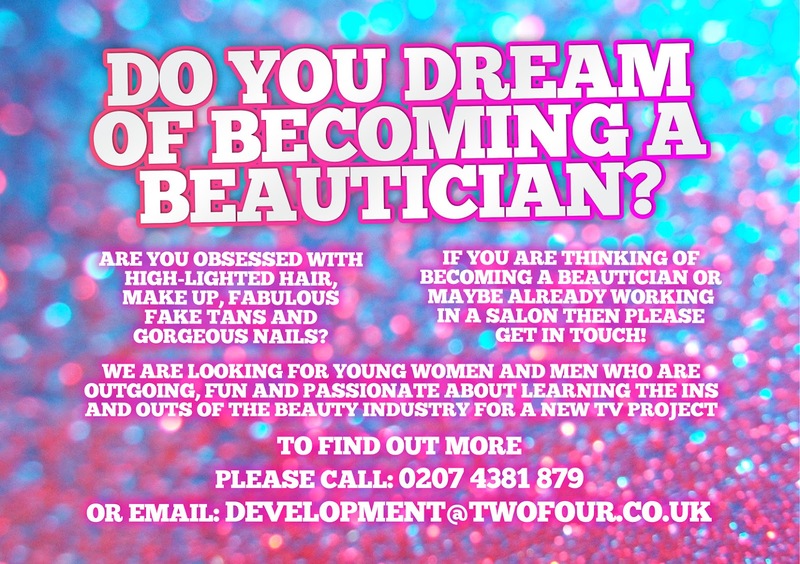 They are currently looking for aspiring beauticians across the UK to take part in a new TV series! These must be individuals who are not yet qualified beauticians, but who dream of learning the ins and outs of the business. The series will be an amazing opportunity for such young men and women to get extremely valuable experience in the beauty industry. So if you’re thinking of becoming a beautician, or already working in a salon then get in touch with DEVELOPMENT@TWOFOUR.CO.UK. More details on the flyer above. ps – if you get this and go big-time, don’t forget me!! Previous Post Cheaper Shellac With DIY Fuse Gelnamel Nail Kit!